Heavy skies and light drizzle but no real rain today. On the radweg we encountered a couple of people from the state tourism department who were surveying passing cyclists so we gave them a good rap. In this area villages are less numerous and some have no shop, bakery or hotel. We stopped in Forst, a large-ish town, that has the Ostdeutscher Rosengarten (East German Rose Garden) and a town centre full of bikes. We visited a bike shop to get chain oil and appreciated the smoother ride that followed. We have seen anti-brown coal posters and banners along the way. There was evidently a human chain a week or so ago in protest against further open cut mining in this area. Another major town, Gubin, is divided by the river into German and Polish sides. The city was extensively damaged in WW2 and the huge burnt out church on the Polish side is still a ruin although with plans in place for reconstruction. This will be a big job! We did some ornithology – saw a huge sea eagle flying overhead and many large birds in a distant field that looked like storks. Our aim was to find a Zimmer Frei – a room in a private house – in Ratzdorf, the small village at the confluence of the Neisse and the Oder. The bike path has many signs advertising this kind of accommodation and we succeeded in locating a perfect place. Our host, Sabine, gave us dinner as Ratzdorf offers little at the best of times and nothing on Monday nights. We were then joined by Peter and Anna from Leipzig who are riding a tandem to the Baltic Sea. We had a great time all together with Peter doing a fair bit of translation to help out as Sabine speaks no English and Anna only a little. Among other things, we found out that the Michael Jackson Playground in Ratzdorf was the result of money donated in 1997 when MJ heard about the plight of the town, then affected by severe floods. He wanted to assist the kindergarten, but there wasn’t one so they got a playground and sportsground instead. 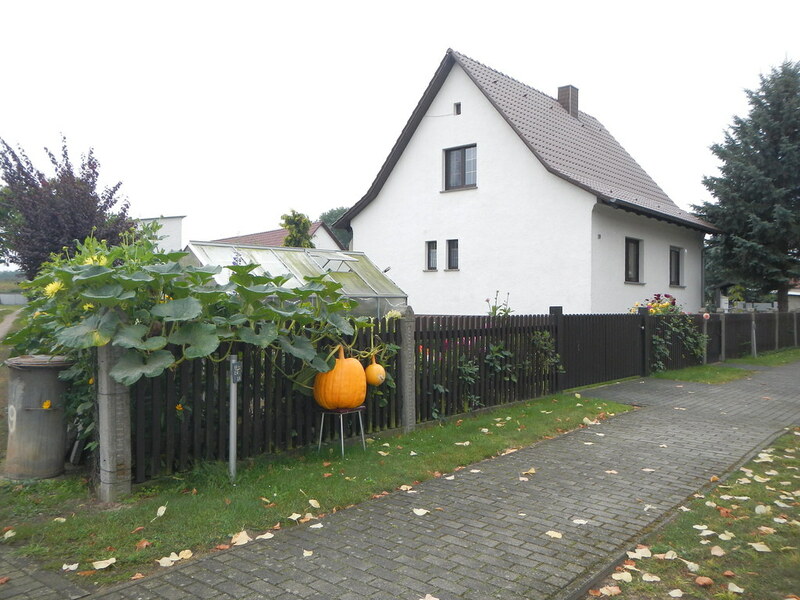 Apart from the meeting of the rivers and the playground, Ratzdorf has a lovely church built from an old barn, a kegel hall (German bowling), a pegelhaus that shows the river level, the Kreuz der Begegnung (cross of the meeting place), a big fishing club and some huge pumpkins! This entry was posted on 1 September 2014 at 7:56 pm and is filed under Europe 2014. You can follow any responses to this entry through the RSS 2.0 feed. You can leave a response, or trackback from your own site.